the "Hub of the Lakes"
Port Carling materializes out of nowhere. One minute you are traveling along Hwy 118 looking at the beautiful landscape, the next you are in a quaint village with many unique buildings. During the winter months the village feels quiet, many businesses are closed and the sidewalks are lightly scattered with pedestrians. 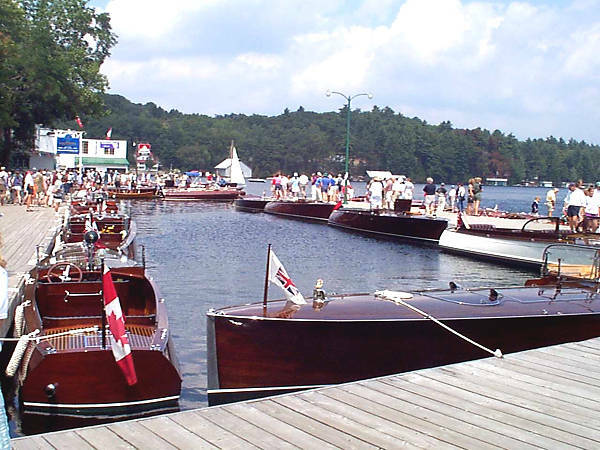 In the summer months Port Carling swells and becomes a bustling village with stores, restaurants, sidewalks and docks teaming with cottagers, tourists and locals. But, no matter what season it is, there is no reason not to discover the beauty of Port Carling. 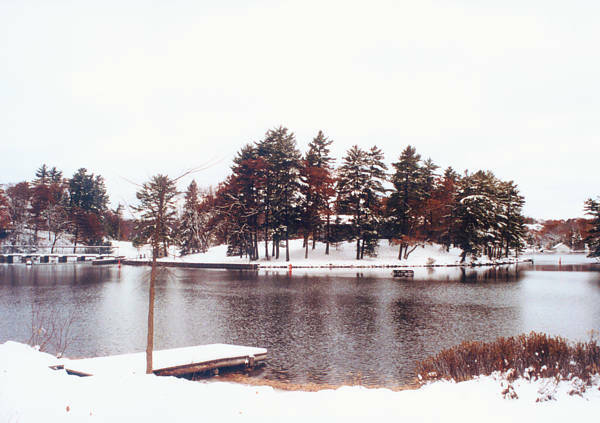 Port Carling is located on Indian River, touching the shores of Silver Lake and Mirror Lake. It is nestled between Lake Muskoka and Lake Rosseau, along Hwy. 118. It is centred between Bracebridge and Bala, and has access to Lake Joseph, Lake Rosseau and Lake Muskoka. 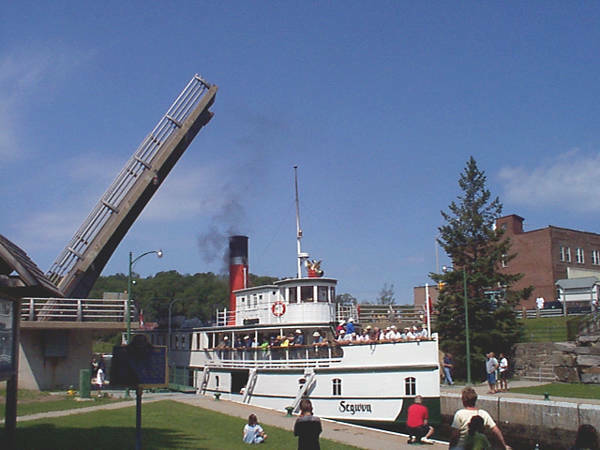 Because of this Port Carling has been dubbed, "Hub of the Lakes".It is also a place to take a tour boat or watch the Segwun go through the locks and the drawbridge, which is right in the centre of town. 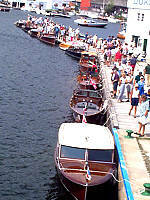 On even numbered years it's the home of the Muskoka Lakes Association Antique Boat Show. The beauty of the area fixated humans long before the first white settlers made it their home, the original habitants even petitioned the government to let them continue living there. It is no wonder why people continue to travel from all over to visit, and make it their summer home. You can shop the stores (many located in old homes, each with their unique styling and atmosphere) or visit the park, library or museum. In the summer you can golf and in the winter there are hockey games, curling and snowmobiling. Special events throughout the summer include: the opening of the museum, Dinner and Dance, Mayors Heritage Walk, the Music Festival, Gift and Craft Show, a Corn Roast and Auction, the MLA Antique Boat Show, Water Ski Show and Golf Tournaments. In the winter, when many older locals have left for warmer climates, when the cottages have been closed for the summer and when the museum is shutting down there are still many events happening in the village. Some of these events are: a Thanksgiving Feast, Remembrance Day Parade and service, Santa Skate, Christmas Dinner and Dance, Winter Carnival and Skating Carnival. It is a great place to snowmobile to, with the trail right along the main street (contact one of the snowmobile associations to be sure of which side of the road to ride on). diplomatic career in July 1966 was not, of course, the half-breed child who arrived in Port Carling nineteen years previously as part of a family that was starting at the bottom of the Muskoka socio-economic and racial hierarchy. I had changed and so had Port Carling." Master. Because of their white father, and the laws at the time, James, his brother and sisters were not able to live on the reserve. Because of their native mother they were subject to racial slurs and not accepted readily into the community. One summer while working for Robert Clause, a wealthy American who cottaged on Black Forest Island, Lake Joseph he was given the offer of a life time. Mr. Clause would pay for Bartleman to get his grade 13 and, upon successful completion, his post-secondary education. He went to the University of Western Ontario and took the four-year Honours History Program. After completion he returned to do his graduate work in their history department but left after a dispute over the thesis topic. From there Bartleman taught high school until he had saved enough money to go to Europe. Once there he hitchhiked and worked his way around, taking teaching positions and even worked as a baker for a short period of time. He decided he wanted to join the Foreign Service, early in his one-year European adventure. His decision was made promptly while at the Canadian Embassy in Helsinki, Finland, wiring his mother for money and being helped by a pretty french woman. He returned to Ontario and to his teaching position for the 1965-66 school year, then wrote the exams for the Department of External Affairs. With his career Bartleman has shaken many hands in many different countries and played an intricate role in how Canada is perceived by the rest of the world as an Ambassador, as Prime Minister Chrétien's Foreign Policy Advisor and as the Assistant Secretary to the Cabinet. Question: "How is Port Carling different now from when you were younger?" Reply: "Well, it is busier. They moved the IGA." Writer in conversation with Almedia Brown, 89, president, Women's Auxiliary. November 2002. "Port Carling may justly consider itself the oldest community in Muskoka." Richard Tatley, author Port Carling, the Hub of Muskoka Lakes. Question: "How has Port Carling changed over the years?" Reply: "We had a school. It's the township office now." Writer in conversation with Elanor Andrew, 80. November 2002. "meeting place" in Ojibway. It is not known for sure, but it is either the Ojibway Sandy Island Band (orginally from Georgian Bay, but wintered on Tobin's Island), or the Muskoka Ojibwas, as they became known after the Robinson-Huron Treaty of 1850, who settled there about 1854 before going to Parry Island on Georgian Bay. The Natives loved the area enough to petition the crown asking for Port Carling ("3 miles by 6 miles") to be their reserve instead of Parry Island. The petition was rejected and by 1870 the last Indians left their homes, continuing to summer in the Indian Village, selling trinkets to tourists, until the 1960s. Today it is known as the Indian camp and is run jointly by the Chippewas and Mohawks. Village, depending on which account you read. In the mid-1800s the government started to build Colonization Roads in the attempt to open Muskoka up to settlers. 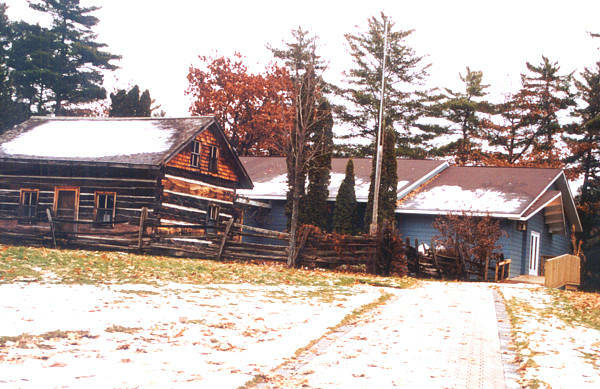 The Free Grant Colonization Road, which ran from Washago to the interior of Muskoka/Parry Sound, was built in 1859. This road brought workers and pioneers to the area, though no one started to settle in Port Carling until 1865, it is "the people who came between 1865 - 1900 (who) were the real pioneers." Benjamin Hardcastle Johnston moved to the village about 1866 and was appointed the first Post Master in 1868, a job he held until his retirement in 1897. He saw the use of opening up a passageway between to the two lakes and collected signatures in support of building the locks. He, along with John Carling and A.P. Cockburn (owner of Muskoka Navigation and Hotel Company), succeeded in convincing the government of the worth of connecting the lakes. This may be the most important moment in the history of the village. The original Port Carling locks were started in 1869 and completed in 1871. 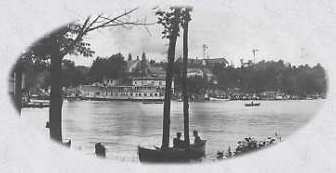 It allowed steamships to travel freely between Gravenhurst and Rosseau, bypassing the Baisong rapids. 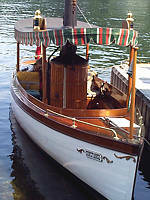 It also allowed The Muskoka Navigation and Hotel Company to expand its fleet. This opened up Lake Rosseau and Lake Joseph to tourists going to resorts and settlers to access their land which was part of the Free Lands Grant. Port Carling itself gained, growing as workers and their families settled in the village. A year which really stands out when reading the history of Port Carling is 1871. This is the year the first resort was opened, William Hanna started his business, and John Thompson decided Steamboat Bay needed to be fortified. 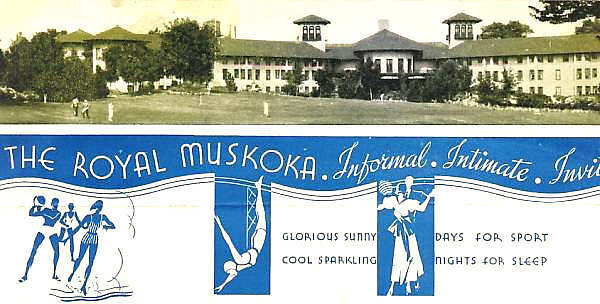 Between 1871 and 1884 four resorts were opened in Port Carling and area, serving a community of 200. Polar Star (1871) was first followed by Ferndale House (1880), Vanderbugh House (1883) and Stratton House (1884). 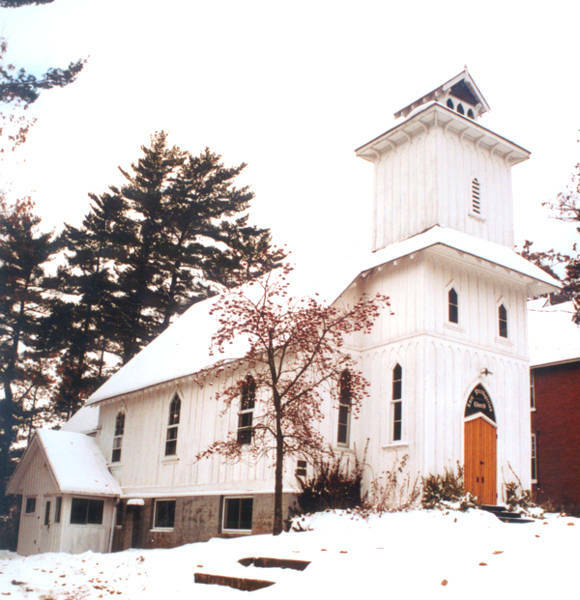 The decade of 1870 also saw the three churches being erected: Port Carling United Church (1872), Knox Presbyterian Church (1876) (photo) and St. James Anglican Church (1875) (photo). 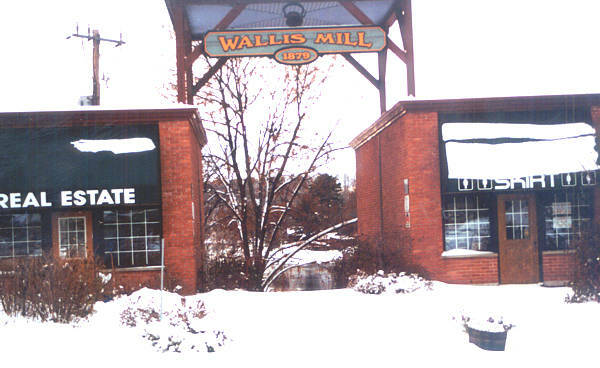 This decade saw two saw mills opening in response to the logging industry. The village's first sawmill was opened by Charles Vanderburgh, but was quickly taken over by Joseph Sherwood Wallis in 1874, who ran it until the early 1900s. The second one was opened by the George and William Beasley , they sold it to John McDermott who kept it open until 1914. The 1880s were the start of tourist based businesses in Port Carling. Frederick Davenport Stubbs, came from Glen Orchard and opened a store across from Interlaken Hotel (formerly Polar Star). Originally a grocery store it quickly expanded and changed as he catered to the tourists who had an 1/2 hour wait while steamships passed through the locks. He ran his business until 1887. The Orange Lodge seems to have had the largest social affect on the town. The club, started by Roger Mahon and George Massey, built their original lodge in 1872. The lodge closed down for a while but meetings continued to be held in James Bailey's home till another lodge was built in 1885 on Joseph Street. The group was reestablished under the name Schomber Loyal Orange Lodge 685. The Orangemen were very-Protestant and pro-British. According to Richard Tatley, "Port Carling was becoming bright Orange, and very few Catholics ever settled there." Dr. William Canniff was the first resident doctor in 1895. The boat business which was started in 1868 by William J. Johnston (son of Benjamin Hardcastle Johnston), began to take off by the turn of the century. His nephews invention of the Disappearing Propeller Boat turned into The Disappearing Propeller Boat Company became the largest company of its kind in Canada in 1922. Eventually this grew to be the Port Carling Boat Works Limited. In 1896, the village wanted to be officially recognized as more than a Post Office in Medora Township. During the winter of 1895-96 John McDermott (first reeve) and Joseph Wallis (became a councillor) put out a petition, asking for official village status. They encouraged the residents of Port Carling to go for village status by saying "they were being short-changed by the Townships of Medora and Wood." June 1896 the area was renamed and incorporated as a village. William Hanna had petitioned to see the area named a town, while Benjamin Hardcstle Johnston pushed for the title of village. Johnston was given the honour of naming the village and calling it the village of Port Carling after his friend John Carling, Minister of Public Works. 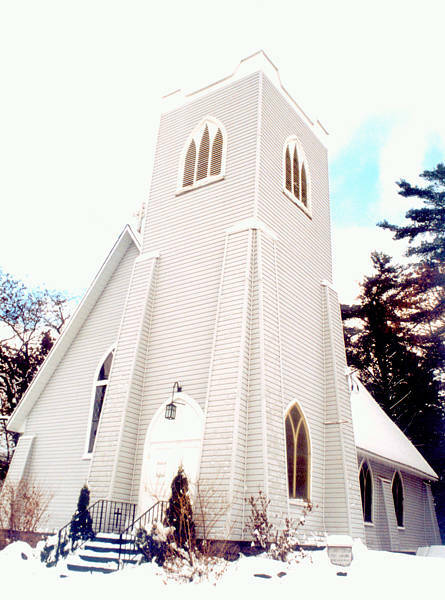 Port Carling United Church: Originally Methodist, it was built in 1872 on land deeded to Rev. Lachlan Taylor by the Crown. In 1925 it became United after a failed merger with the Presbyterian Church. Knox Presbyterian Church: Built in 1876. The first wedding held in this church was in 1914. The land for this church was given by the Bailey estate. In 1925 they rejected a merger with the United Church. St. James Anglican Church: Taking 10 years to complete, the building of this church was started in 1875. The fist baptism was in 1881 with the first marriage in 1886. Because of its proximity to the summer resort, Stratton House, the noise would disrupt services. New land was purchased and the new church was opened in 1912. The original burned along with Stratton House. The first church was on property owned by Mr. Michael Bailey and the second location was bought from the Roman Catholic Church. Polar Star: Polar Star was the first resort to serve in the Port Carling area, opened in the fall of 1871 by John Thomas. In a few short years it had three name changes from Polar Star to Interlaken in 1886 (by R.A. Arskey) and The Port Carling House in 1897 (Joseph Ruddy). Vanderburgh House: Charles Vanderburgh sold his store (the Bay View House) in 1881 to William Hanna and built the Vanderbugh House in 1883. He sold it in 1887 to Stephen Cope and left Port Carling for good. It has gone by the name of London House while owned by Stephen Cope. R.A. Arksey bought it in 1899 for use as a private home. John Cope rented it in 1911 and renamed it Beverley House. Finally it went by Beverley Beach Inn while owned by Thomas Pelletier. the Canadian Keswick, eventually becoming an interdenominational Bible Conference Centre. It was destroyed by fire in 1945 but was rebuilt with stone. In 1976 the Canadian Keswick went bankrupt. Today the property is empty, but was purchased with the hope of becomming a resort once again. Stratton House: John Fraser and wife Alexandrina ran it till John's death in 1902. It burned in 1912 under the ownership of George Cannell. 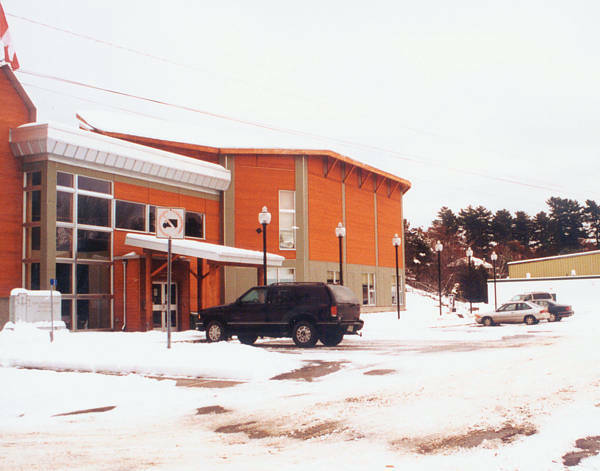 "It was a sad day when the Memorial Centre was taken down." Question: "Did you take part in the Winter Carnival when you were a young girl?" Reply: "It was a skating carnival. Prizes were handed out for best costume. The centre of the ice was decorated to look like a winter scene. I won first prize one year as a Japanese girl." 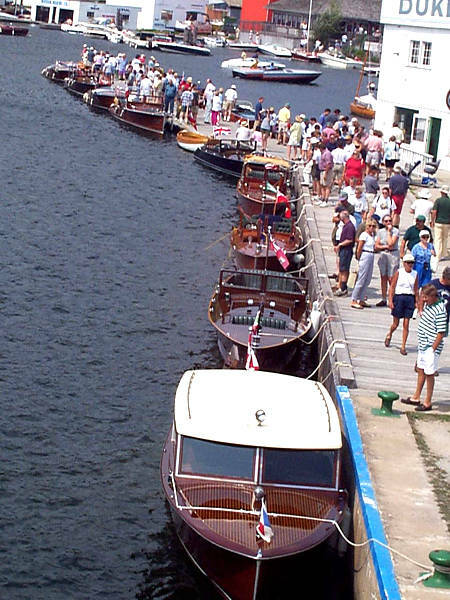 "Not for nothing was Port Carling known as the boat builders town." "Early memories of life in the summer in Port Carling Bay include the Sunday night services held by Dr. Hughson and a congregation of rowboats and occupants around the end of the the Port Carling dock." "Two sawmills supply the people with lumber, and the usual mechanics' shops are found, with the exception of the shoemaker. There is a good opening here for some enterprising son of St. Crispin." Question: "Why did you move to Port Carling?" Reply: "It was a good town to raise my family in the Christian manner." Port Carling has come full swing since its incorporation in 1896 which made it more than just a Post Office in the Townships of Medora and Wood. 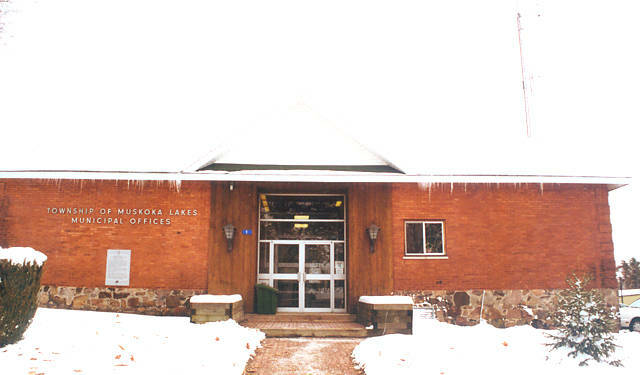 Port Carling is once again a Post Office location in a township, this time it is the Township of Muskoka Lakes, created in 1971. It is a village full of dedicated people, who take pride in their community. The village has a history of service groups helping wherever help is needed and of people giving their all during W.W.I and W.W.II. They did all this while learning how to have fun and etch a living in the place they call home. From the first ship the village has opened their streets to the people not lucky enough to live there year-round. This practice did not stop with incorporation, it still continues today. More hotels and resorts were opened after the turn of the century running for a few years before their owners retired, they burned, or like Shamrock Lodge, are still running today. William Foreman opened Endian Lodge just below Mirror Lake in 1901, running it until 1912 when he sold for it $6,500. It changed hands a couple of times before finally being bought by Rupert Duke and renamed Arcadia Lodge. William's brother, Walter, turned his home into a small resort in 1907, naming it Havington Farm, after "a place the Foreman's had known in England." Riverdale House was opened by Richard C. Harris, it was also a small resort opened out of his home. 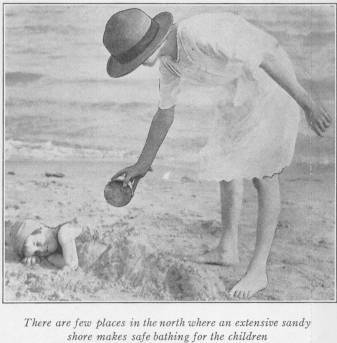 A similar resort opened in the home of Ernest and Emma Duke called Shorehaven. It opened in 1923. Alfred Edward Johnston turned his family farm into Shamrock Lodge in 1934. The locks, which played an intricate role in the growth of Port Carling, received a face lift between 1902 and 1903. Built of concrete it was enlarged to 160 feet by 32 feet wide. This was done to accommodate steamships at their height of use. During this time local businessmen had to move their stores. Hanna and Sutton were among them. The locks changed again in the 1920s when a small lock was built into the dam for the use of private boats. This project was in the works from 1921 to 1922. The wooden bridge, spanning the Indian River was replaced with a steel bridge, a two-year project started in 1921. 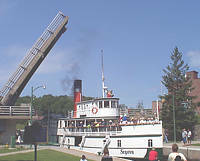 It was rebuilt again from 1973-75 to be a lift bridge. With its location accessing three large lakes it is little wonder that Port Carling had a large boat industry. 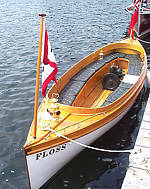 Locally invented and built boats have even been used by the Canadian Navy and are the subject of books to this day.
" apparently responding to appeals from the boat building firms." Along with those services, the village also supported two saw mills which went out of business when the lumber men left. In the 1950s Port Carling had acquired taxis, a hardware store, electricians, a painting and decorating shop along with a whole slew of business, some opened year round and others seasonal. Around the turn of the century Port Carling had two water systems, one for the south side and one for the northwest side of the bridge. This was soon followed by electricity and the telephone. Residents had more spare time now then ever before, allowing many different recreational activities to start up. Boat racing became popular along with ski jumping, hockey and curling. An open air rink and a covered rink were in use as early as the 1900s. The Palace Skating Rink, built at the location of the present rink, was built in 1929. About 1906 Joseph Ruddy, owner of the Port Carling House, opened a two-story drug store/ice cream parlour selling it to John Whiting around 1911. The Toronto man , added a veranda and balcony and hosted dances on the upper level every night when musicians were available. Whiting also hosted a children's costume party every Thursday night. He owned the business until 1953. Twenty-One Club after the fire of 1931. He had moved from the locks to the main street location in 1907 and then sold in 1913.
was built in the location of the Town Hall / Memorial Centre. Every community has a story of a great fire, Port Carling's took place during the nights of October 27 and October 28, 1931. The first night the Port Carling Boat Works burned to the ground, the second night destroyed "Hanna's store .... the Bank of Nova Scotia, the building being owned by Mr. George Sutton; Mr. Sutton's Ice Cream Parlour, the Duke Motor Company Works, the Post Office, the freight shed on Lock street, John Wallace's barber shop, George McCulley's butcher shop, Victoria Hall, the Bay View House and Clark and Brown, electricians, on Maple Street." By June of 1932 all but the Bay View house had been rebuilt. A volunteer fire brigade had been started in 1912 after the Stratton House fire but it wasn't until 1913 that council ordered a fire engine which they sent back as unsatisfactory. The volunteer fire brigade did have some hose, two extension ladders and fifty buckets. Today Port Carling's Fire Department is one of 10 in the Township of Muskoka Lakes. The automobile changed the village again. Garages opened and the roads were ploughed. Three garages were in the village by 1938. William Massey built the first one in 1923 and named it the Port Carling Garage. This was followed by Douglas Massey's Standard Garage in 1925 and Lorne Davidson's Garage in 1932. 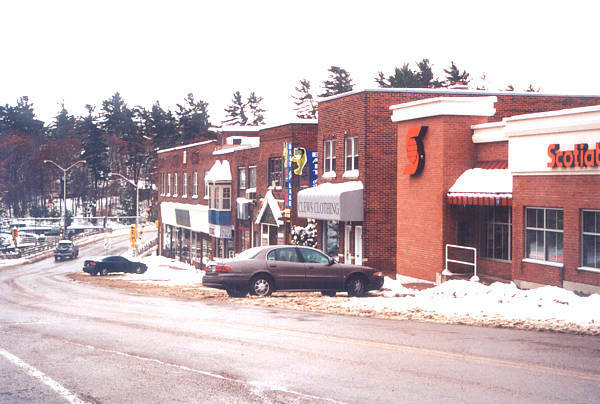 Today Port Carling has stores all along the main street, a newly renovated rink, the main branch of the Townships libraries, the Township offices and a post office, along with all the stores, restaurants and accommodations. 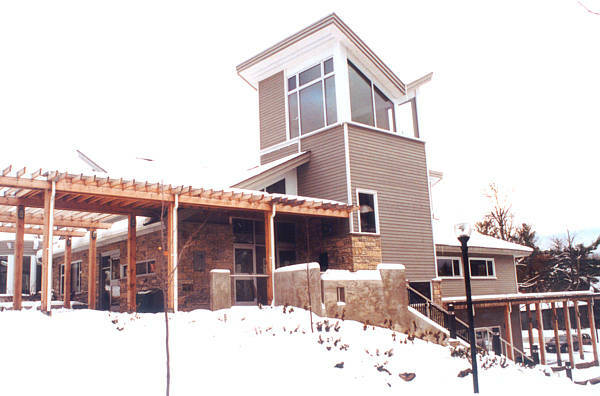 The island is now the home of the Muskoka Lakes Museum. Though much has changed over the years one thing hasn't, people still stop and watch as a steamship goes through the locks. 1921 - The island was turned into a park. The "centre was leveled for tennis courts and a bowling green, while a lock was built around the outer perimeter." 1921- William Joseph Johnson rented out his building on the Island to Grame Bell, for use as a motion picture theater. 1923 - Bill Massey bought the first motor car in the village and opened the first garage, naming it Port Carling Garage. 1924 - Mrs. Hanna donated their property at the end of Bailey St. to be used as a motor park. It is now Hanna Park. 1956 - There were nearly 30 business operating. The Hub Club: Started in 1954 by Mrs. Ed. Wilson with the intention of reviving square dancing in the village. This club is no longer in existence. Sandford Women's Institute: Started Aug. 10, 1903, first to run the Winter Carnival and cater the Lion's dinners. With 13 members between the ages of 60 - 90 they will be celebrating their 100 birthday in 2003. Though not very active in the community the members do still raise money for charities such as the OPP Food Drive. Lions Club: November 21, 1945. Some things they do include Organizing the Winter Carnival, hosting Thanksgiving Turkey Diners, annual golf tournament. The club is still active in the village. early years. They were frowned on because their members drank while the village was "dry". Then "with idle fingers and itchy fingers," they started to help out in the community. Some things they do include handing out student subsidies, helping with the hockey clubs, hosting a Christmas Party and holding a flea Market in August. The legion is still active in the village. allowed to be on from 5 or 7 pm to 10:30 pm. If the night was not very dark they weren't turned on at all. By 1919 residences were having electricity installed in their homes. Water: The first was Water Works Supply Company for those living on the south side. They supplied the water by building a pump house above the dam. Some of the original shareholders were the Hanna brothers, George Sutton, and Alex Cameron. The brother's father, William Hanna, formed a water company for the northwest side of the bridge. What became known as the Port Carling Water Supple Company, started out with Hanna wanting water pumped into his store so he built a water tower inside Johnston's fort, pipes were laid and a pump house built at the base of Wallis Hill. These two utility companies were merged in 1947.
telegraphed out. The telephone took over the telegraph in 1902. the Bracebridge and Muskoka Lake Telephone Company put poles and line up in Port Carling in June. The first telephone was at the exchange office in William Killen's house. The luxury quickly expanded to other business. By 1923 there were seventy-three customers with the company. their own booze because the town was 'dry' at the time. It was built on the property of George Sutton's Ice Cream Parlor and Meat Market which burned down in the 1931 fire. The Twenty-One Club's roof collapsed in 1953 and the building was subsequently sold. Before being torn down in 1984 it was used for a storage shed by Duke Boats . School House: Schooling was started in the late 1860s. 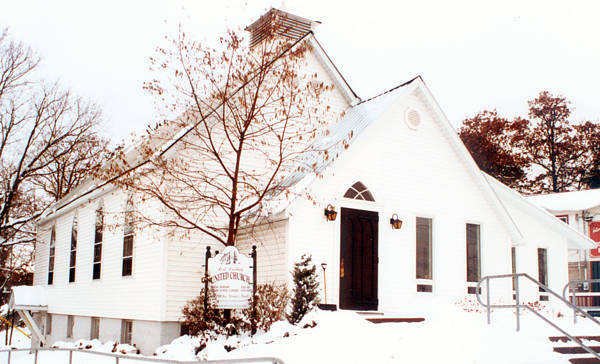 The first school house was built about 1875 with a larger, white brick, one built in 1896. The old one was rented back from Joseph Wallis when there was need. The red brick school house was built in 1906 after the white brick one was destroyed by fire two-years previously. The school house had four rooms, two were strictly public school with the third, the grade eight room was partly high school. The fourth room was strictly for high school students. They had a school fair which included growing plants at home and marching to the town hall. Students are now bussed to Glen Orchard and the school house is now the Township Office. opened a boat livery at the upper end of the locks in 1897. In 1898 William Joseph Johnston, added to his business and ran a boat livery from underneath the Post office with the help of John Matheson. He built the Dreadnaught and Fearnaught . His nephew, William J. Johnston, Jr. helped out with the livery from the Port Sandfield side. While there he built the Disappearing Propellor Boat, then turned it into a successful company named the Disappearing Propellor Company Limited which had a factory on the Johnston property in Port Carling. 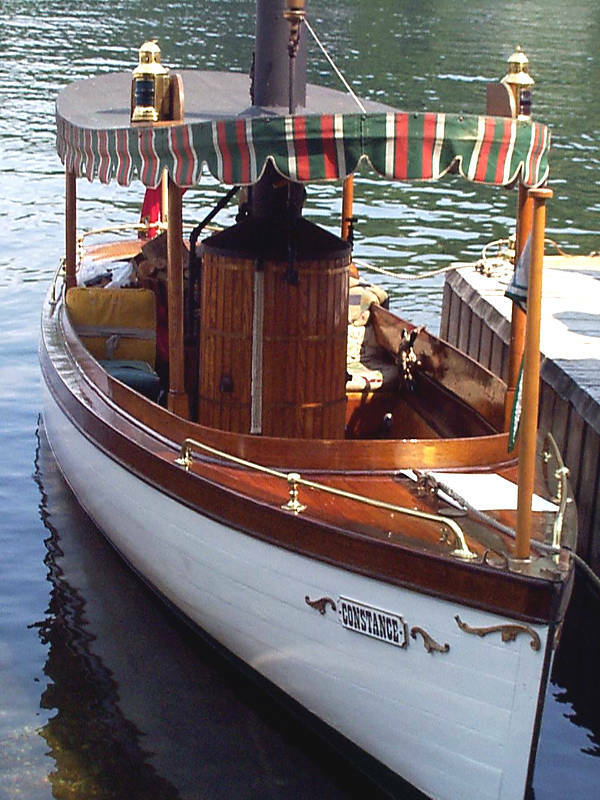 The company was liquidated in 1924, but Johnson, Jr. opened Port Carling Boat Works, Limited the same year. Matheson who had helped Johnston, Sr. for a bit, opened his own business in 1906. He sold his business to Ernest Greavette and C.J. Duke in 1924 who renamed it Greavette and Duke. 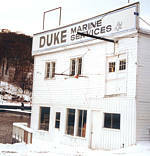 Greavette withdrew and the company was renamed Duke Motor Service and then Duke Boats in 1931. - Cope, Leila M. - A History of the Village of Port Carling. Hearld-Gazette Press Bracebridge, Ontario. 1956. - Various clippings from local newspapers. "Port Carling, one of the earliest settlement on the lakes, is destined to become one of the most important, by reason of its central location, the key of the three lakes; all whose business has to pass its locks and all whose floating population in its excursion pass to and from upon its river-lake." Toronto World, July 14, 1887. Author John Denison thinks Frank Micklethwaites wrote the article. Copyright © 1998-2008 Baytides Management Inc.